Your students will love these ideas for making Halloween containers from recycled materials. They are fun to create and functional. A perfect place for teachers to fill with treats! Here are three to consider with photos and instructions. Ghouls, goblins, and monsters come to mind during this time of year. Whether it’s Frankenstein, the king of monsters, or one a child dreams up – monsters are fun during Halloween. Prepare your work surface for messy art. Spread newspaper on the tabletop and on the floor to capture excess paint and glue. Since children will be painting, you may want to have them wear a paint smock to protect clothing. Have the child choose the paint color for the toilet roll tube (the monster’s body) and place a dollop of this paint onto a paper plate. Dip the paintbrush into the paint and cover the entire tube with this color. Set this aside to dry. If you are making multiple monsters do this step with each tube. Vary the colors so the child has an assortment of creatures to decorate. Use a hole punch and punch two holes across from each other on the cardboard tube. You can go down as far as the hole punch device will allow. Thread a long pipe cleaner through the two holes. On each side of the tube, curl the pipe cleaner or bend it to make tentacles or wire extensions from your monster. If you want to make arms, the holes need to be lower – you may need to make the holes with another type of punch. Make sure an adult helps with any device that is sharp. Glue the eye or eyes on the monster’s face as desired. Use craft foam or construction paper to cut out any other type features you want on the monster. Glue these in place. 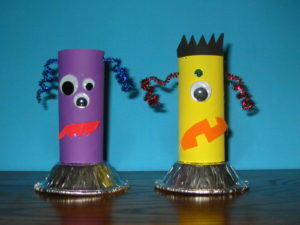 Your cardboard tube monsters can stand up on a tabletop as is (sealed with tape or paper on the bottom), or you can glue them to small boxes or tart tins to make a platform. Now teachers/caregivers/parents can fill the containers with treats. Two paper plates stapled together make handy treat containers. This is a fun craft to construct together. Allow the students to hang them at their desk. At the proper time, fill each container with surprise treats provided by the teacher and room parents. Take the two plates and cut an opening (slice) at the top. Teachers can have these prepared for the younger kids, or guide them with a pre-drawn line and allow them to cut the pumpkin with safety scissors. Place a dollop of orange paint onto an extra plate. Encourage the kids to paint the pumpkin; one side on each plate. Set this aside to dry. In the meantime, have the kids cut out jack-o-lantern facial features from black construction paper. They can be traditional triangle shapes or something unique. Staple the two plates together along the rim to form a pouch. Insert a ribbon hanger. Have the children glue on the jack-o-lantern’s face. Take a small piece of the curling ribbon (curled by the teacher with a scissor) and glue it to the top of the pouch for a pumpkin stem. Teachers/Parents can tuck a favorite Halloween treat (pencil, eraser, stickers, goodies, etc.) inside this ghostly-decorated lunch bag. So simple, and so much fun! 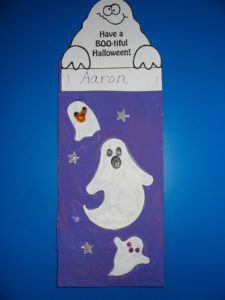 Give your students a lunch bag and encourage them to paint the front side with a Halloween color of their choice. Give them a couple of options. Set this aside to dry. As a teacher, I loved to take advantage of clipart on the computer. Find ghost shapes and even a topper for the bag. Print out sheets and give the children a copy. 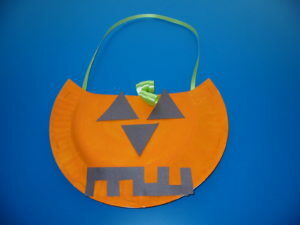 Invite the children to cut out the shapes and glue the ghost figures on their bag. You may allow them to enhance their ghost bag with glitter glue and stickers if you have them available. Make sure each child writes his/her name on the bag topper. Fill this special bag with treats as Halloween approaches.